If you find yourself lucky enough to be in the area of Bogota, going to Mount Monserrate is simply a must see attraction! 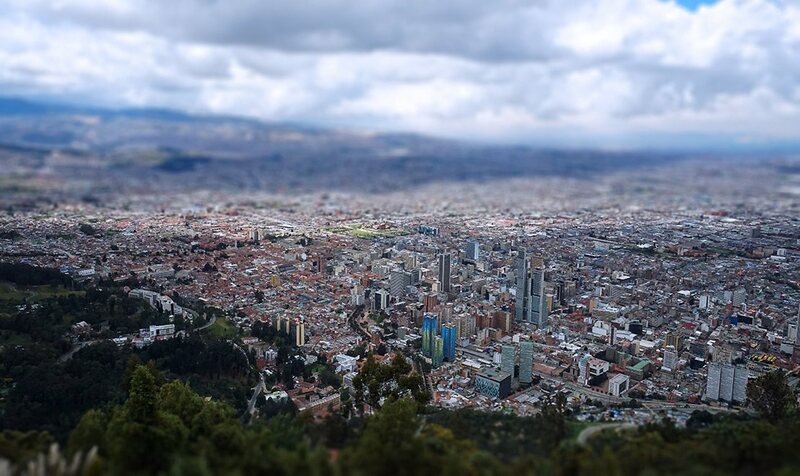 Monserrate is the majestic mountain that stands tall in the center of the city of Bogota, Colombia. It has a height of 3,152 metres or 10,341 feet above sea level. At the top of the mountain, you can see for miles and miles across Colombia when the weather is clear, which is a picturesque view in many ways. The main attraction on Mount Monserrate is a church, The Monserrate Monastery, built in the 17th century which features a shrine dedicated to El Senor Caido, or “The Fallen Lord”. Monserrate has been a sacred part of the community since the pre-Colombian era, and continues to be an important religious symbol to this day. Mount Monserrate is a special place where tourism runs strong, in fact, it is one of the most popular tourist attractions in Colombia. The summit of the mountain has souvenir stores, and other tourist attractions. There are two eating destinations, San Isdro House which is open from Monday to Saturday from 12:00 to 24:00. and the Santa Clara House which is open Tuesday through Sunday from 12:00 to 17:00, also on Sunday 09:00 to 17:00. Both of these restaurants mainly serve authentic Colombian style food options It is accessed either by the aerial tramway, climbing trail access, or a funicular. Since the mountain faces west, it is the perfect place to watch the beautiful sunset over the city and take memorable photographs to look back on for the years to come. There are three different ways to get to the top of Mount Monserrate. Depending on your level of fitness, fear of heights, and travel preferences, there might be one option that is better for you than the others. Maybe you want to get the full experience and try all three! Regardless, here is more information on how you can travel to the top of Mount Monserrate. Climbing– One way to get to the top of Mount Monserrate is to take the bus to the Los Aguas station, following the tramway all of the way up the mountain. Another option is to take the bus to the Teleferico bus stop and walk because it is a bit closer. You can walk right along the open river and follow that road to the building near the tramway. The path is closed on Tuesdays, but if it isn’t not closed you can walk to the bottom. If you’re looking for a physical challenge and happen to be a physically fit person, you can walk up the mountain! It will take one to two hours to reach the top this way. Cable Car and Funicular– There is a regular cable car and funicular that run from the Cerro de Monserrate from the Monserrate Station. The funicular is open in the mornings until noon, and the cable care is available in the afternoons. Lines seem to go quicker at the funicular when compared to the cable car, but both offer different experiences, so be sure to try them both. Both options take around five minutes to reach the top of the mountain. Why not take the funicular up and the cable car down, or vice versa, to get the whole experience when you decide to visit Monserrate? It’s worth noting that local travel agencies also offer private tours of Monserrate. The way that this usually works is that a private vehicle picks you up from your hotel and takes you to the summit. You can choose the method you want to get up the mountain, and the tour can end with a drop off at whatever hotel or accommodation that you’re staying at. This is a great choice for those who want to learn a bit of history and tidbits of knowledge from an experienced tour guide in Colombia while taking in the beautiful views. Admission is around 20,000 pesos both ways. The usual price for a one way funicular or cable car trip at Monserrate is 9500 pesos. Monday through Saturday after 17:30, the ticket cost increases to 17,000 pesos. Are you the type of person who wants to enjoy a clear space with no crowds present? We can’t promise that there won’t be crowds, but the days that aren’t as bust will be weekdays. Early in the day is generally when crowds are the slowest, so keep this in mind. Crowds are busiest on Sundays when locals attend church, however, there are usually half off discounts on this day. If you want to go when there are less crowds, be sure to avoid Sunday! If you’re using the funicular, your instinct will be to take the curve to your left, but it’s best to take the curve to the right of the island on the left side. This way, you won’t miss the stations of the cross and statues. The view can get a big foggy if it is humid or rainy due to the height above sea level, so be sure to take a look at the weather before you come if you want to get the best possible view. The view at night is a lot different than the view during the day! The lights surrounding the area stand out in quite a beautiful way at night, so consider checking it out then! Be sure to bring cash with you if you want to take advantage of the numerous shops on and around Monserrate. The vendors are all very kind, so it is a great experience looking at what they have to offer to bring something home for yourself, friends, or family. For more information on Monserrate, give them a call at 057-1-7470189-057-1-2845700. One thing is for certain, and that is you will not regret visiting this source of beauty in Bogota, Colombia.